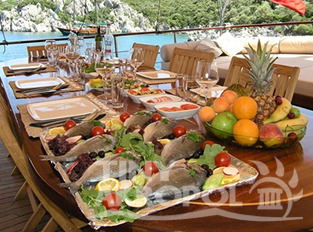 Turkish cuisine is ranked among the world's top cuisines - right there after French and Chinese. Fresh vegetables and fruit are plentiful deliciously fresh and lusciously sun-ripened. Bread is a particular treat - freshly baked every day and dangerously more-ish! 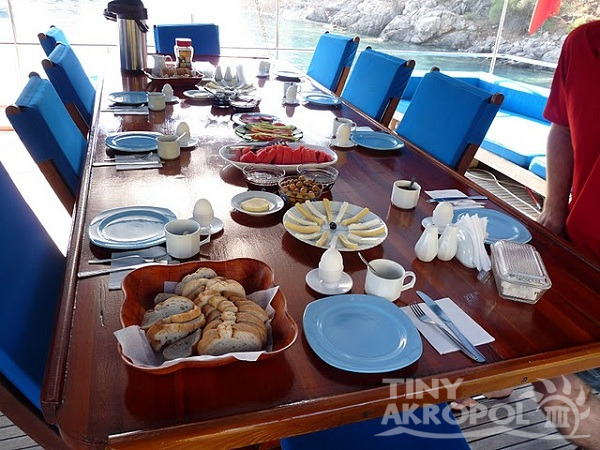 Whilst on board your day will start with traditional Turkish breakfast consisting of fresh bread with cheeses, olives, honey and jam, yogurt, tomatoes and fruit. A light lunch is next in line - with perhaps stuffed aubergine, rice and salad one day, and savoury pastries stuffed with meat or cheese (börek), accompanied by the traditional combination of yogurt, salt and water known as ayran, the next day. Afternoon tea takes place around 5 pm. After an early evening nap, dinner concludes the day with traditional mezes, freshly grilled seafood and meats, salads and fruit to finish as the sunsets and stars come up. 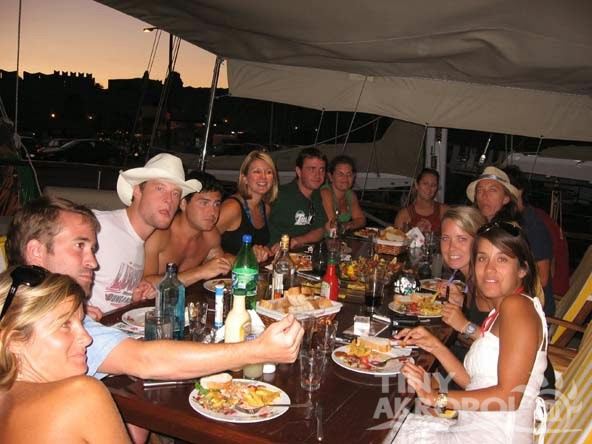 You might want to try to catch your own fish for a barbecue on board or on the shore - as with everything on a gulet cruise, flexibility is the key. 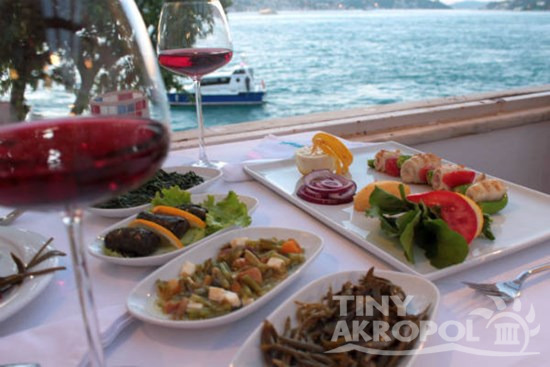 Local drinks are excellent accompaniments to dinner - try raki with water and ice for a traditional & highly intoxicating touch, local beer for extra refreshment, or perhaps one of Turkey's range of home produced wines. 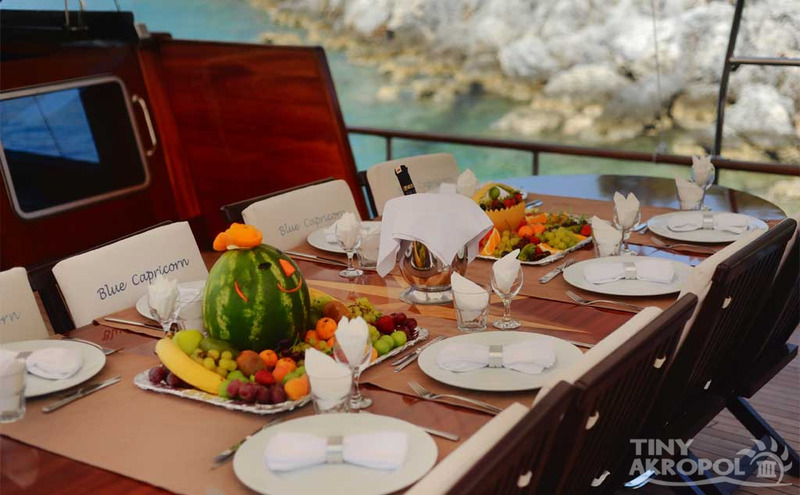 You can buy all kind of drink from the bar on board or Private Charter guests are also welcome to provide their own beverages.